Glentoran celebrate Paul O'Neill's opener. Pic: NIFL. 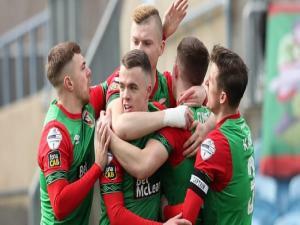 Ballymena United have slipped nine points behind Danske Bank Premiership leaders Linfield after losing 2-0 to Glentoran at the Showgrounds on Saturday. It was a first home defeat of the season for David Jeffrey's team. Paul O’Neill and Robbie McDaid scored for the Glens who played the last 20 minutes with 10 men after full-back James McCarthy was sent off. The victory moves Gary Smyth’s men up to seventh, the final European play-off place. Sky Blues skipper Jim Ervin insists that with seven games still to play he's not giving up on the title race just yet. 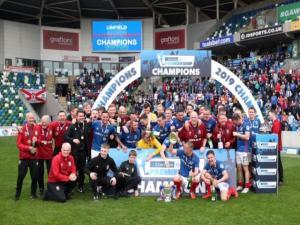 Linfield beat Institute 2-0 at Windsor Park on Saturday with Jordan Stewart and Josh Robinson on the scoresheet. Ten-man Crusaders had a 2-0 derby victory over Cliftonville. Brothers Jordan and Kyle Owens grabbed the goals at Seaview - Rory Hale was red-carded. There were 1-0 wins for Warrenpoint against Ards in Bangor and Glenavon over visiting Dungannon Swifts.